WOW! 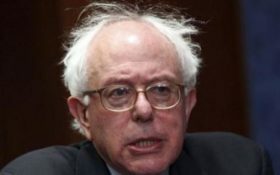 Bernie Sanders teaming up with Fox News?! Presidential candidate Sen. Bernie Sanders is desperate for attention. And he’s willing to go right into the lion’s den to get it. Fox News Channel says that Sanders will appear on a televised town hall on April 15, making him the first Democratic candidate to venture onto Fox for this type of event in the current presidential cycle. It’s an important booking for Fox, after the Democratic National Committee announced last month that it would not hold any of its presidential debates on the network. Sanders’ decision was met with surprise and dismay among some liberals, many of whom let their opinions profanely be known online. Carolyn Fiddler, political and communications strategist for the progressive website Daily Kos, called Sanders’ decision to do another Fox town hall “unfortunate and dismaying” and said it’s certain to upset many Daily Kos followers.